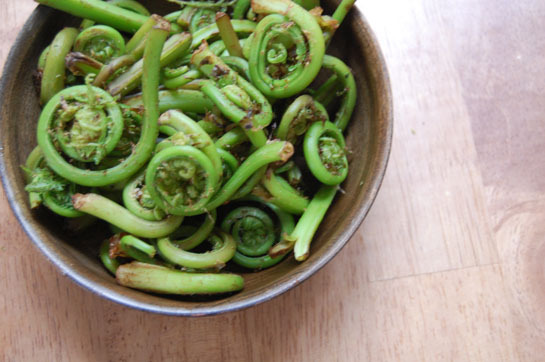 Ok, the good stuff is rolling now: garlic scallions, ramps and, my new fleeting favorite, fiddlehead ferns. People compare the flavor to that of asparagus, but I think its a milder, cleaner taste—and nothing like the bitterness of many wild greens. They seem to love lemon and garlic. Speaking of spring, and green things, and asparagus: The Fair Food Farmstand gets in their first shipment of stalks this week. Holla.